Video slot Flip Flap from the manufacturer of software for online casinos SkillOnNet can be called original, unusual and fascinating. The heroes of the game are funny faces in the form of cubes, which are put on spokes. Video slot Flip Flap consists of three spokes, each of which rotates five cubes. The maximum available number of paylines is 10. The game has a great three-dimensional graphics, all the characters are perfectly drawn and animated. Wild symbol itself does not form winning combinations, is only on the middle drum and at the moment of appearance on the screen it stretches to its full length. 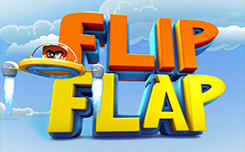 In the video slot Flip Flap there are two bonus mini-games. In the first you will need to look for the same cubes. For each pair you find, you will receive a cash prize. In the second bonus game you have to knock down parachutes. In addition, Flip Flap has free rotations of drums that start at least three special characters. This prize game is divided into several rounds, each of which has its own coefficient of increase in winnings.